Google fonts are an online repository of more than 800 free webfonts. If you can't find a font that you like in Website Builder, you can try a Google Font. Click on the Edit text button that appears above or below the component. Select More formatting in the moveable menu that appears. Click on the + icon located next to to current font type. Choose a font from the drop-down menu, or click the arrows to navigate through the list. In the preview box you can see how the font will look. 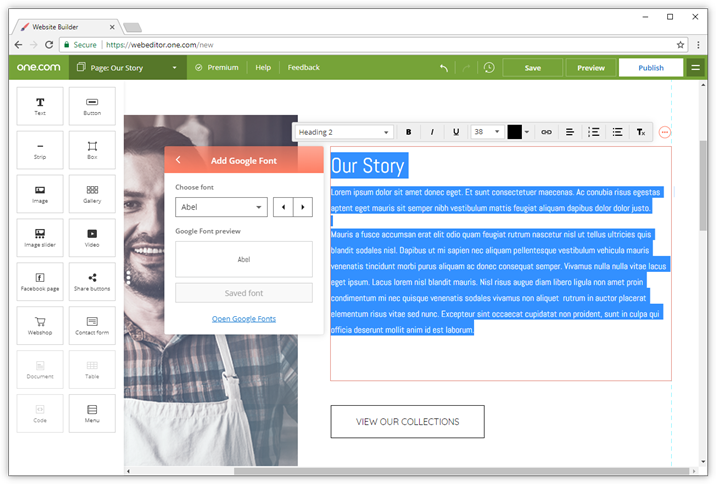 Once you have found a font you like, click Save font to add it to your fonts in Website Builder. Tip: Click Open Google Fonts, if you want to search and filter fonts by different criteria. When you have found the font you want, look for the name in the drop down menu inside Website Builder.